2:52 in the chat room MM points out that the high hit the pit pivot price. May be all there is. 2:42 my down fractal has fractured, so I'm done trading for the day. 2:34 TG asks how today's pattern is like or unlike Monday's. The intraday patterns are similar. Monday gave a late rally. 2:13 by hotline rules we are out of the trade window, so if elected into a trade, it will not be a hotline trade. 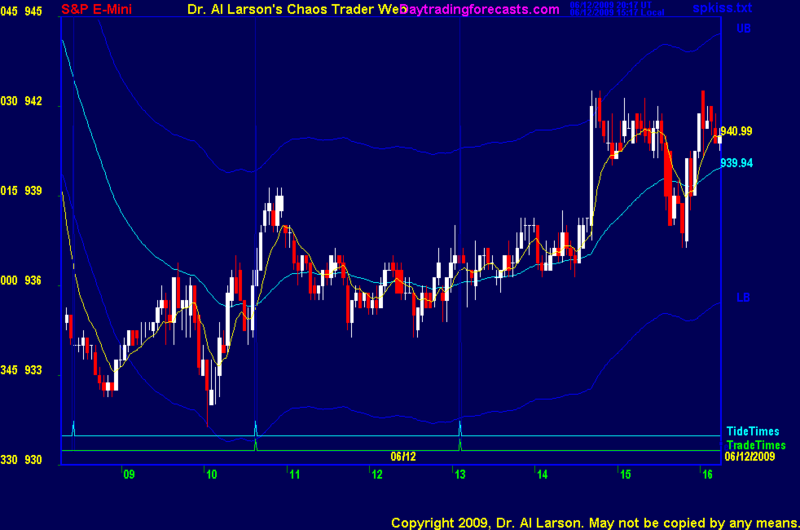 1:33 the two day range is about 27 points; divide that by 3 says a congestion could last 7 trading hours. 1:18 congestions are states of rest in a market system. Prices rest, then make a chaotic move to another state of rest. Chaos follows dullness. So don't get bored and leave. Be ready for the chaos when it comes. taken my 4 main courses. For more info on courses, see http://moneytide.com -> courses. 9:45 on the MTRainbow chart the white 440 minute EXMA is down, near 941. It should limit any news rally. The 440 EXMA indicates the day's major direction. 6/12/2009 1:39:01 PM MT DBJ****:: I see the 7 moves that you mentioned TG. We will have to wait until Monday now to see how this move pans out, but I have uploaded a pic of the FOP that I saw when I tried to reproduce the one that Al found. It looked like it was going to fracture too, but it hasn't quite yet. 6/12/2009 1:00:43 PM MT TG****:: DBJ, my read is similar re: likely beginning and end of fractals. Monday mornings initial thrust down was toward the end of a down fractal that had been in place nearly all day Friday, the lower low in early afternoon only broke down by 1.5 pts and only .5 pts on a closing 3 minute bar basis, so akin to a double bottom with a minor throwover. Today one could have argued there were 7 moves to this mornings low with 4 distinct pushes lower in about 4 1/2 hours including today's preoutcry session. That's an atypical fractal but feasible and like you said, probably was more likely a move 1 of a bigger down move. But either way, no new low by about 2:30 and shorts get squeezed. 6/12/2009 12:41:47 PM MT mm****:: Iran has a new president - is that the reason for the jump? 6/12/2009 12:38:14 PM MT DBJ****:: Al may make his own comments as requested, but my take on TG's question is that last Monday, the market gapped down, retraced, then went to a new low. Also, there were 7 clear moves down from the High on the previous Friday. The move today looks more like a short rest before a bigger move down. 6/12/2009 12:24:00 PM MT TG****:: Al, if you get a chance during the clinic, could you say what key things about today's pattern make it disimilar to this past Monday's. Seems like a lot of similarities thus far.